If you want to reduce damaging inflammation in the body, you might want to pop something else alongside your omega-3 supplement. That “something” would be an aspirin, as researchers have found the combination can work beautifully. The study shows that aspirin triggers the body to produce “resolvins,” which stem from omega-3 fatty acids. These resolvins shut down the inflammation, which is tied to a wide swath of conditions, including arthritis, lung disease and heart disease. Specifically, it is the resolvin D3 found in the omega-3 “DHA” that stays and fights inflammation longer than other resolvins. Thus, combining a safe dose of aspirin with DHA supplements or servings of fatty fish can directly battle inflammation. Aspirin appears to trigger a longer-acting form of resolvin D3. In the lab, scientists were able to prove that the resolvins showed strong anti-inflammatory actions. In mice, the compounds also stimulated the stoppage of inflammation in the body. What’s next in this area of research is potentially identifying which diseases linked to inflammation could be treated by the aspirin-omega-3 combination. 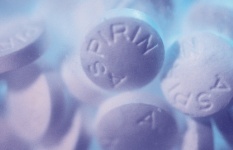 A few tips before you begin aspirin therapy. Your doctor should be in the loop and know the full range of drugs and supplements you are taking. Be mindful that cold and flu remedies and other over-the-counter drugs could contain more of the active chemicals within aspirin. Thus, you might be getting too much. And finally, watch out for any dark stools or unexplained stomachaches and pains. Aspirin can increase your risk of gastrointestinal bleeding. Dalli, J., et al., “Resolvin D3 and Aspirin-Triggered Resolvin D3 Are Potent Immunoresolvents,” Chemistry & Biology 2013; 20(2): 188.